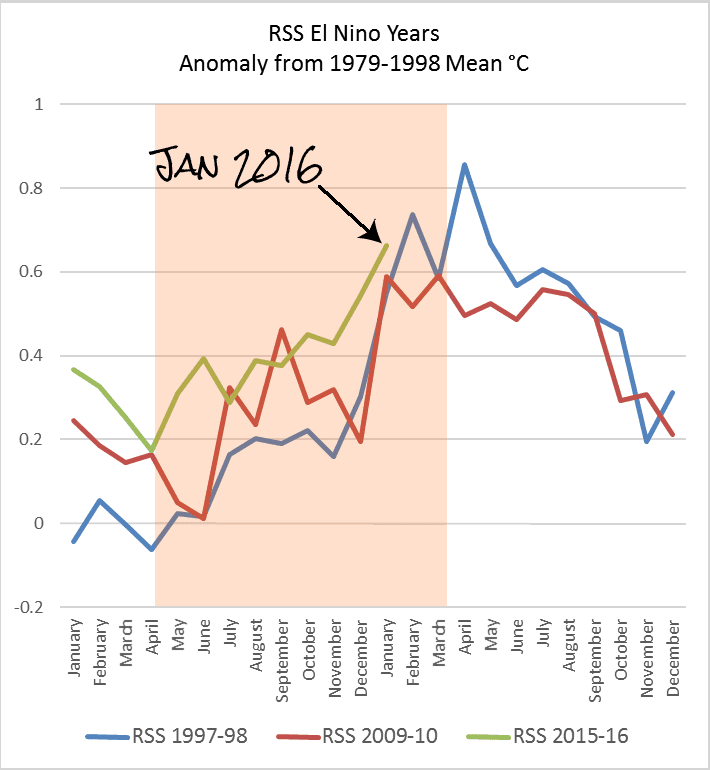 The January data for RSS is now online. 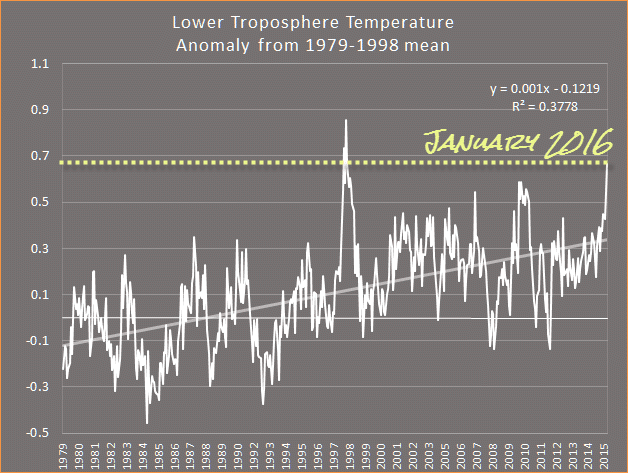 At 0.663 °C above the 1979-1998 mean, January is the hottest January on record for the lower troposphere, and the fourth hottest month on record. 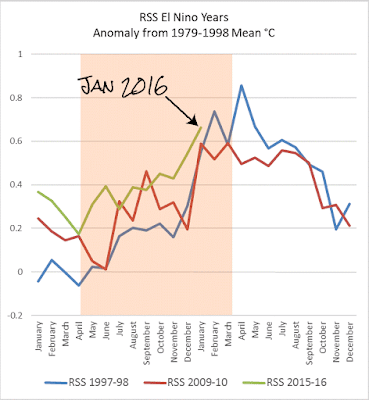 For RSS there are three consecutive hottest for the respective months, the hottest November, hottest December and hottest January. The only months hotter than January 2016 were in 1998:- February (0.736 °C), April (0.857 °C) and May (0.667 °C). The chart below compares the El Nino years of 1997-98, 2009-10 and 2015-16 for the lower troposphere, as recorded by RSS. I don't understand why anyone uses satellite data in the context of climate trends given all the problems with calibration, orbital decay, stitching together records from different instruments, vertical weighting, etc. etc. etc. etc. Don't get me wrong; satellites are great for lots of things. Err, I'd hazard a guess that it's because they are running colder than the thermometer record. AND they show the "PAUSE". But Stealey said on a (fairly) recent thread that they could "trust" Christy/Spencer and Mears. Though in the same post he also said that Mears had "discredited himself long ago" (because of his "thermo record more reliable" comment). Yep them's deniers - hypocritical and contradictory. I don't understand why anyone uses irregularly spaced, scant numbers of surface station measurements subject to all the failings of metrology and the urban heat island effect. 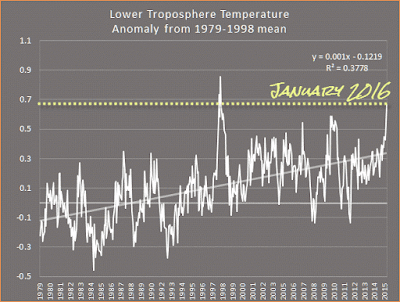 Do you understand why anyone uses broadbrush estimates of temperature in the air, when they haven't any hope of differentiating between the temperature one km up and the temperature four km up, or the temperature of cloudy skies vs the temperature of clear skies, or the temperature of the troposphere vs the temperature of the stratosphere. All based not on thermometer readings but on microwave sounding instruments on various satellites, each subject to drift and orbital decay and calibration differences. If you can accept that, then it becomes very easy to accept the value of actual thermometer readings, recording temperature on the surface. BEST found that UHI-affected stations, and their adjustments, show a lower trend than rural stations alone. It simply does not bias the trends high. You not understanding something is your own problem. So Metrology has nothing to do with satellite measurements? Anon - In metrology 'calibration' has a specific meaning. "CALIBRATION: Operation that, under specified conditions, in a first step, establishes a relation between the quantity values with measurement uncertainties provided by measurement standards and corresponding indications with associated measurement uncertainties and, in a second step, uses this information to establish a relation for obtaining a measurement result from an indication." The PRTs and radiometers onboard were calibrated before they left Earth. Last I checked the PRTs have not been recalibrated since they reached orbit. While many companies offer ISO 17025 accredited calibration services, and many of them perform field service calibrations, none of them are currently making stops in outer space. While the radiometers are routinely 'recalibrated' - this is not strictly true in a metrological sense. While the 'cold target' has a reasonably known value, the 'hot target' essentially has unknown value and uncertainties. Various inter-comparison methods have been tried or suggested, but the fact remains that what is called 'recalibration' is more aptly called 'our best guess'. "...subject to all the failings of metrology"
You don't like measuring things. Uh OK. I've never seen an adequate explanation from Christy or Spencer, of exactly which balloon indices are shown in that graph they keep showing. The graph says "NOAA," but NOAA's web site presents NOAA's RATPAC-A as NOAA's radiosonde index that is appropriate for looking at global trends. And RATPAC-A well matches surface trends and not RSS or UAH. Christy is intentionally misleading the US Congress. Christy's graph says it uses the "UKMet" balloon data from about 1978, but the UKMet's web site says its global index contains data only from 1997 forward, so Christy's graph must be using only the European index! I'm also curious about the graph on page 3 of Christy's testimony, showing a comparison of UAH verses balloon stations for USA and Australia. It seems to show an almost exact correlation for each month, whereas the first graph shows significant differences in the global data averaged over 5 years. It just seems too good to be true. For what it's worth, not the truncated date range. I do not know if that makes a difference, but it is at least "suspicious" that he cuts it off 12 years ago. Also note this is TMT not TLT. I suspect--just like I suspect aspects of the rest of the paper--there is some large amount of cherrypicking going on rather than a full and complete analysis. But ask an expert for real corroboration. Yes, it's suspicious that the comparison ends in 2005, especially when according to Tamino, most of the divergence has occurred in the last few years.